Every now and then, I’ll stumble on new restaurants while browsing Urbanspoon. Recently, I clicked on the “Recent Restaurants” link and was taken totally by surprise. The location is what grabbed my attention more than anything until I clicked the link to the Facebook page. The restaurant is called Food Street and at first, it appeared to be in the Vine Neighborhood. The pictures really caught my attention because it had one of my favorite phrases on it. Italian beef. Upon further inspection, whomever added the restaurant to Urbanspoon got the address a little wrong. This new restaurant is actually in Portage. 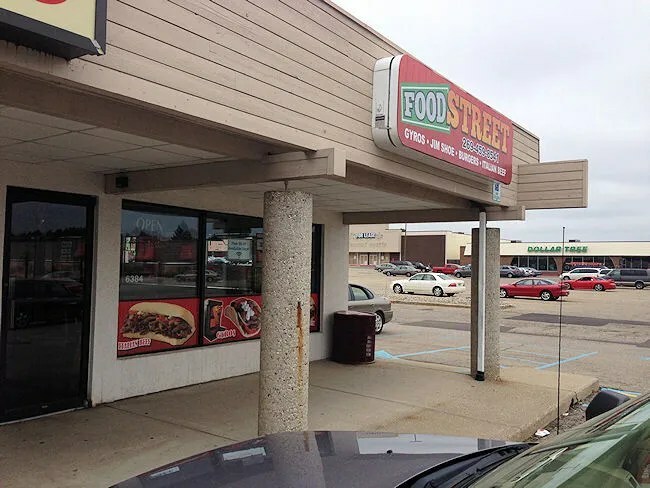 Food Street moved in to the space that was most recently State Burger on Westnedge at Mall Drive. The location is actually on the Mall Drive side of the little strip mall and it’s kind of hard to see at first. The store hasn’t changed much since State Burger left. The large map of Michigan is still painted on the wall as you walk in and the kitchen/order area is still set up exactly the same way. It even has the somewhat awkward ordering system where you put in your order, they cook it, then ask you what you want on it at a condiment bar next to the cashier. The menu has three big options. 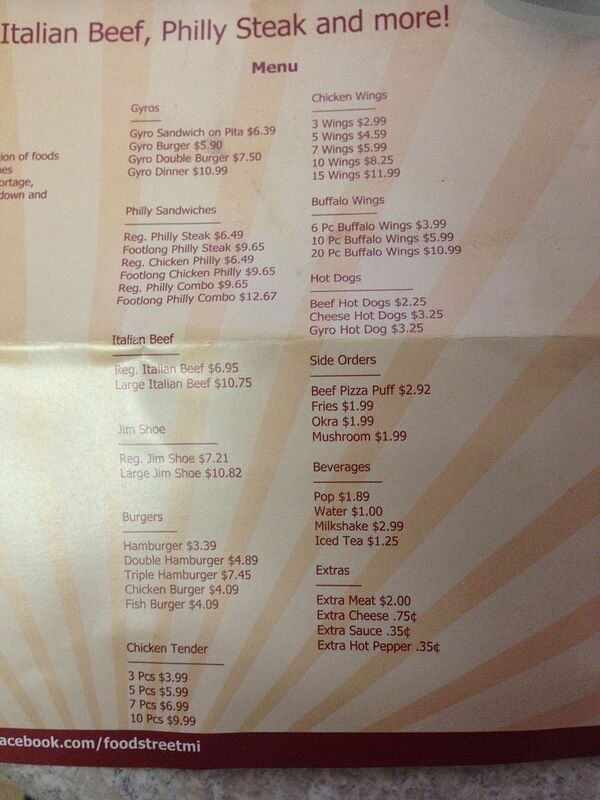 There’s Philly Cheesesteaks, Italian beef, and something called a Jim Shoe. Apparently, a Jim Shoe (Gym Shoe, Gym Shoo, or Jim Shoo) is a Chicago thing. Honestly, I’ve never heard of it, but that’s not surprising. There are pockets all over Chicago of legendary sandwiches and unless you spent A LOT of time eating a small sandwich stands in the city, it’s pretty easy to find something you’ve never heard of. I didn’t order the Jim Shoe on this trip although I should have given it a shot. 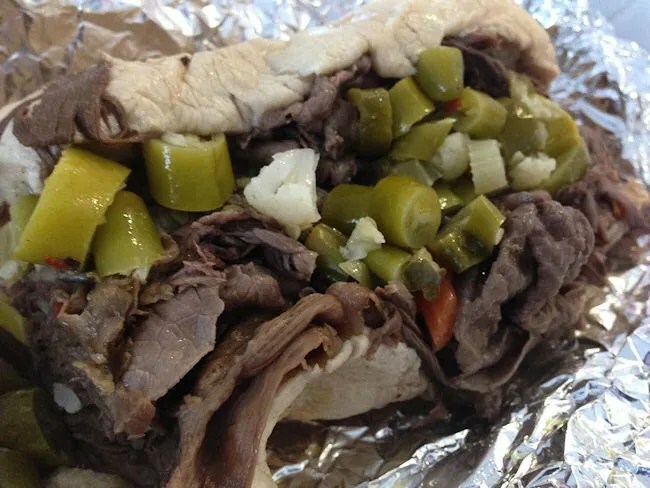 It’s hard for me to pass up an Italian beef though….so that’s what I got. I ordered the large Italian beef. That was sort of a mistake because it’s huge. At a guess, it’s a 16″ inch sandwich. I didn’t even try to eat the whole thing. It was cut in half so I just wrapped the second half back up to take home for dinner. The sandwich meat is pretty typical for places outside of Chicago. It’s frozen meat that is poured in to hot gravy and warmed back up. This makes the meat a little tougher than something that is fresh sliced, but the flavor is still there…especially when you dip the bun which I asked the cook to do and he dipped the whole thing. The bun was nice and soggy with that great flavor of onion and oregano that makes up the Italian beef gravy. To top things off, I added on the hot giardiniera. The sandwich was pretty good. The bun disintegrated (I like that in an Italian beef…more flavor) and the giardiniera gave that awesome spicy taste. The frozen meat was a little noticeable, but since there aren’t a lot of Italian beef choices around here, I really have nothing to complain about. The sandwiches all come with fries, so the three of us shared my fries. I had more food than I could eat with the sandwich, so I happily shared. They weren’t anything special. 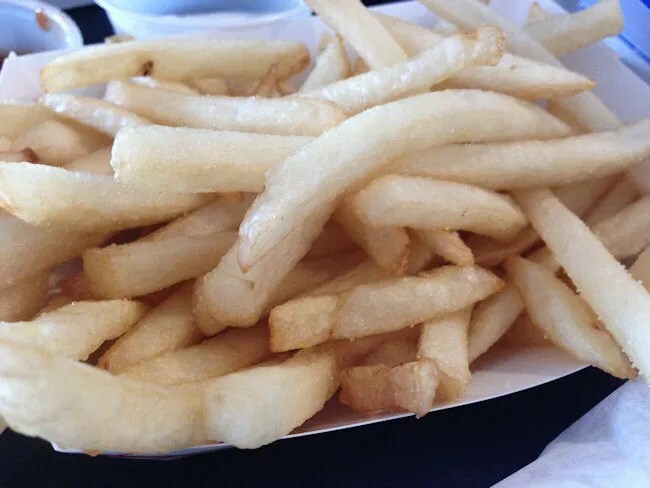 They were just crispy, salty typical fries. There really wasn’t much on the menu that J was interested in. There aren’t any sandwiches that really did anything for her, so she ordered a five piece chicken tender for her and L to share. 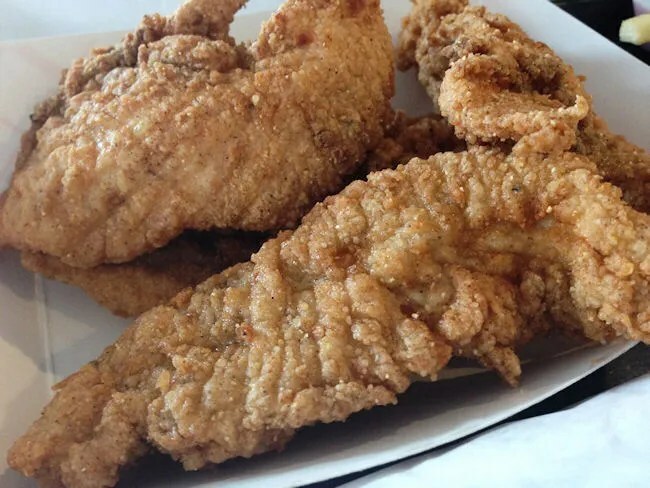 The tenders were fresh out of the fryer and very juicy….not greasy, juicy. I burned my fingers trying to tear one in to small pieces for L. She ate one whole tender and a handful of fries while J ate two tenders and some fries. J was kind of up in the air on whether she liked them or not. On the one hand, the meaty parts were plump and juicy, but there was a lot of extra breading which was a little hard and chewy which she wasn’t a fan of. She ended up giving me the last two tenders to take to work with me along with my Italian beef for dinner. The cost of our meal was right around $20 once we added on a couple drinks, but half of that was my sandwich alone. Food Street isn’t bad for what it is. It’s somewhat typical of the kind of places you find all over the neighborhoods in Chicago. I enjoyed my sandwich and the chicken strips while J was a little “eh” on it. I get a lot of people asking me about Philly Cheesesteaks in this area and I never have an answer for them. Just from seeing another order being made, this is probably one of the more authentic looking Philly’s I’ve seen in the area (although I didn’t see any Wiz), but Cheesesteaks aren’t really my specialty. Italian beefs are and this one was better than average. Your review is great I agree with j it is not exceptionally impressive and their burgers taste horrible. The first time we went my husband ordered the italian beef to share and it was good. There was another woman sitting next to us that ordered the Jim Shoe and she gave us half of her sandwich while we contemplated what to order. 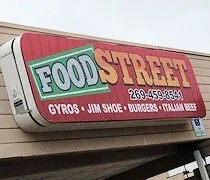 The Jim Shoe is a meat colaboration of corned beef, roast beef, and gyro meat. I will say it is big like the Italian Beef, but the highlight is they carry mild sauce. For anyone that’s been to Chicago or grew up there it is important. Basically good place to eat and relatively cheap. Next time grab some mild sauce.